The Khmer people in the south have maintained their particular cultural attributes. Visitors to Vietnam’s south are sure to be impressed by Khmer pagodas hidden in forests of tall trees, whose beautiful design and architecture feature unique decorative patterns and murals on gates, towers, fences, terraces, and walls as well as inside their chambers. The Khmer are followers of Buddhism and build pagodas wherever they may live. For the Khmer people in the south of the country, these pagodas are not only a spiritual and cultural space and community venue - they also express the lives of local people. Around 600 pagodas have been built in this part of the country, of which many are centuries old and been recognized as national relics. Vietnam has more than 1.3 million Khmer people living in the Mekong Delta cities and provinces of Can Tho, Tra Vinh, Soc Trang, Kien Giang, An Giang, Bac Lieu, and Vinh Long. They earn a living from farm work, fishing, and handicrafts. 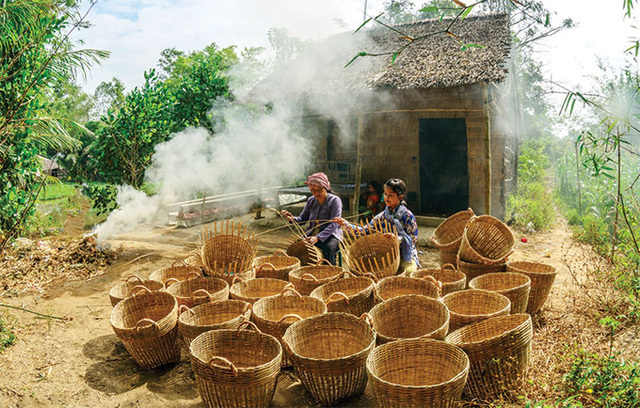 If you were to visit a Khmer hamlet in Soc Trang, Tra Vinh or Bac Lieu, you may be taught how to prepare a type of food called “com dep” (flat young rice) or be invited to try Simlo soup, a traditional Khmer dish. Baskets made for daily life are simple but full of artistic touches. 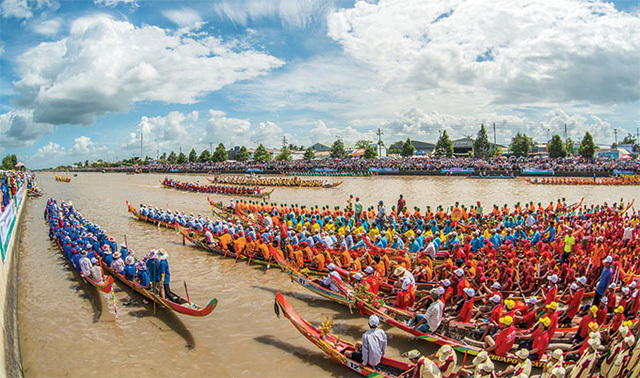 While Soc Trang and Tra Vinh are famous for Ooc Om bok (Festival of Worshiping the Moon), one of the biggest festivals of the Khmer people and where a “ngo” boat race is the highlight, a Cow Racing Festival is held every year in An Giang province and attracts large numbers of visitors, many of whom describe it as the most muddiest, chaotic and energetic of them all. Maintaining their unique culture and lifestyle, the Khmer have enriched the country’s culture overall. There are many other wonderful things about the Khmer, thanks to their rich culture of folk songs, folk tales, festivals, temples and pagodas, and vivid spiritual life. Travelers will soon notice that the quiet grace of their culture has not been mixed with other ethnic minority groups. It can be found in the innocent and natural smiles of Khmer children or of old women wearing a “khan ran” (the traditional black and white checkered shawl) on their head and shoulders. “Khan ran” have become their symbol and an essential part of their life, and are used for various purposes: to help them fight against fierce sunlight, to carry a child, to hide them from prying eyes while they change clothes in the fields, or as a towel to dry off with after swimming in a river. Architecture from days long gone dot HCMC'S city centre and are in need of preservation.